Watermelons conjure memories of lazy summer days. Just looking at a picture of them seems to relax us. But it’s not just in your head. Watermelons actually lower your blood pressure. Research proves it. Food scientists at The Florida State University conducted a pilot study of four men and five postmenopausal women, all aged 51 to 57. All nine participants had pre-hypertension, a precursor to cardiovascular disease. Researchers gave the subjects six grams of the amino acid L-citrulline/L-arginine from watermelon extract on a daily basis. L-citrulline is converted in the body to L-arginine which is required for the formation of nitric oxide (NO). NO is essential to the regulation of vascular tone and healthy blood pressure. After six weeks the subjects had improved arterial function and lower aortic blood pressure. L-arginine is available as a dietary supplement. But for many people it can cause nausea, gastrointestinal tract discomfort, and diarrhea. The fruit has none of those effects. The authors dubbed this melon a "functional food." They suggested it has a vasodilatory effect which may prevent prehypertension from progressing to full-blown hypertension, a major risk factor for heart attack and stroke. Functional foods are those that are scientifically proven to have health-promoting or disease-preventing properties above and beyond the healthy nutrients they supply. According to the study published in the American Journal of Hypertension, watermelon is the richest edible natural source of L-citrulline. It is also a good source of vitamins A, B6 and C, as well as fiber, potassium and the antioxidant lycopene. L-citrulline is also available as a supplement and the authors believe that supplementation might allow people to reduce their dosage of blood pressure drugs. A previous study by the same group showed that four weeks of L-citrulline supplementation slowed the increase in aortic blood pressure which, combined with hypertension, is associated with higher rates of heart attack. According to the study the optimal dose of L-citrulline is four to six grams a day. Since it would take about 4 pounds of watermelon to get a therapeutic dose, it would be impractical to rely entirely on the whole fruit for the benefits of L-citrulline. But it is not only the L-citrulline that contributes to heart health. Because it is rich in potassium, this red melon also helps keep salt from raising blood pressure. In addition to its benefits in lowering blood pressure, this colorful fruit has a wealth of other qualities to recommend it. For one thing, its name aptly reflects its 92% refreshing and hydrating water content. Its bright red color comes from lycopene, a powerful antioxidant also associated with heart health, healthy arteries and blood flow. Of all fresh produce, it contains the highest level of this compound. Multiple human studies have shown lycopene's ability to protect against many forms of cancer including prostate, breast, endometrial, lung and colorectal. The antioxidants in watermelons also strengthen the immune system and alleviate symptoms of asthma, osteoarthritis and rheumatoid arthritis. It is even believed to play a role in the prevention of diabetes and to reduce blood sugar levels. 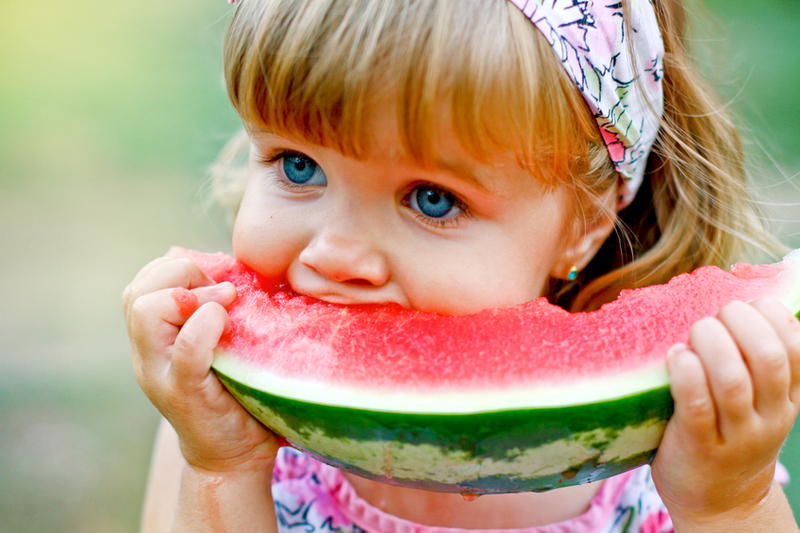 Watermelons and other foods rich in lycopene have anti-inflammatory properties making them natural sunscreens, preventing and repairing sun damage to the skin. 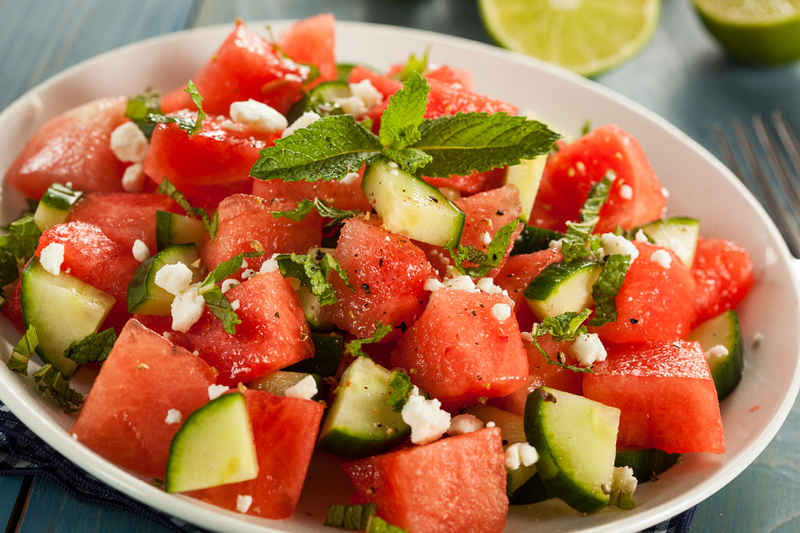 This makes watermelon a perfect choice for a hot summer day – or any time. For more healthy foods for menopause, click here.